Compared to premature babies that were not read to they have better communication skills when older. Every parent wants to do what they can for their child and when you are feeling so helpless with a baby on the neonatal unit you don’t think something so simple could be so effective. We all know that reading to children is important but you don’t think it could be so beneficial when they are this young and tiny, the discovery certainly surprised me. Luckily I love to read and before I had my little boy you would regularly find me curled up on the sofa with a good book in hand. Now I have an active toddler and reading my books is a luxury! Since I became so aware of the benefits of reading to a premature baby I decided to support children’s authors each month by featuring a different book. 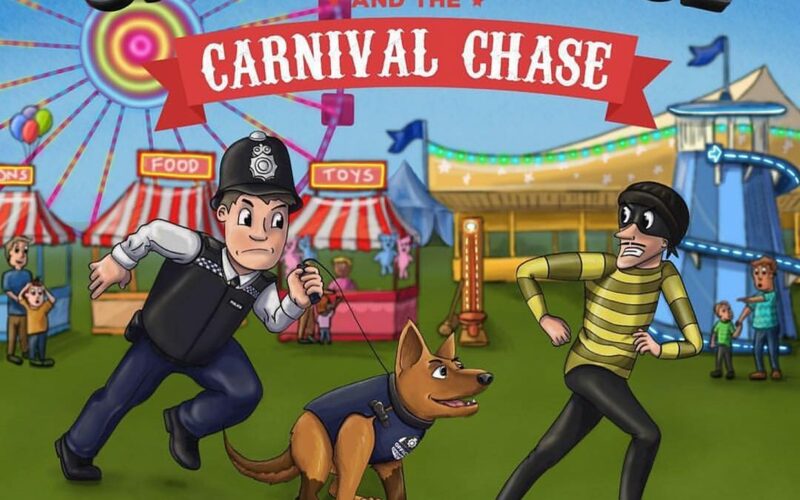 This month I feature Officer George and the Carnival Chase, some of you may remember that I featured the first Officer George book back in 2018. I have been following Matthew and Adam’s journey and got back in touch when I saw on Instagram that they were working the next Officer George instalment. The serving officers have been busy writing and illustrating the latest Officer George story over the last few months and it is finally ready and available to buy on Amazon. We received our copy of the book recently and we love it! New characters have been introduced, one of which is Bodge the police dog. We have a German Shepherd so my son keeps calling Bodge Jack. Jack sometimes gets called Chase (another famous German Shepherd pup in the world of a toddler) so no doubt our poor dog will soon be going by a third name of Bodge very soon! The rhyming story is great for young people with inquisitive, wandering minds like the young character Max, and studies show rhyming stories help young children pick up language quicker. There is also a strong important message teaching children if they get lost from their parents at something like a carnival, like Max got separated from his dad in the story, who they can safely turn to for help. I also love the exercise at the end that puts children’s detective skills to good use. The illustrations are vibrant and perfectly help to tell the story. Every adventure filled story needs a bad guy too, which in this case is Toothpick Nick. Will he be caught though? You will have to buy the book to find out! Matthew and Adam have also branched out and introduced fabulous Officer George hooded sweatshirts, lunch bags and backpacks which are available on the Officer George website.